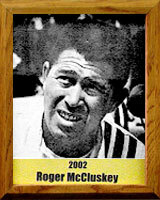 A professional race car driver, Roger “Leadfoot” McCluskey attended Mansfield Junior High and Tucson High School. As an amateur, he raced jalopies at many tracks throughout the Southwest. He was U.S.A.C. Sprint Car champion in 1963, winning over A.J. Foyt; USAC Sprint Car champion in 1966 (Mario Andretti was second); and USAC Stock Car champion in 1969 and 1970. Roger started 17 times in the Indianapolis 500 and placed third in 1962 and 1973. In addition, he won five national championships, 23 stock car titles and 23 sprint car victories. Roger originated a rookie orientation program in 1981 for the Indianapolis 500. This program is still in force today. He served as Director of Competition for the United States Auto Club; was Chief Stewart at Indy; and was a driver rep on the United States Auto Club Board of Directors.